Sector Adepts x Lanthan.audio Showcase. 22.04.2016 Artheater CGN. 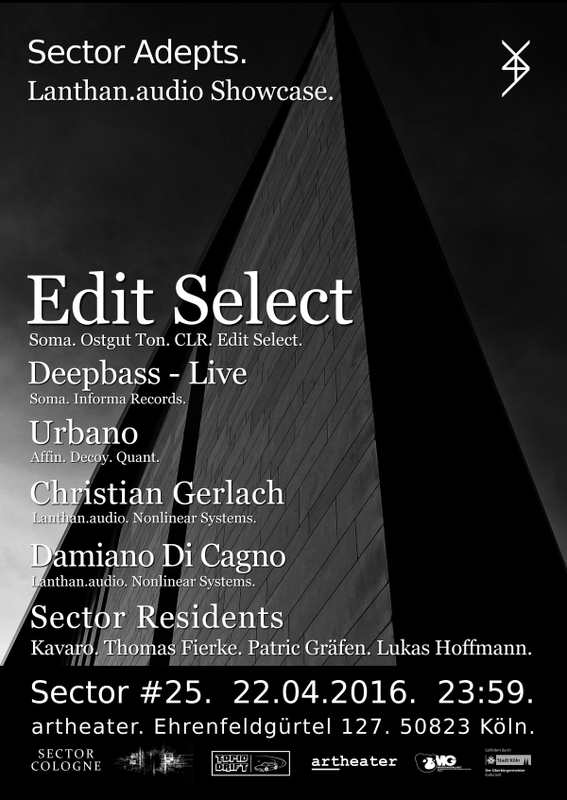 For the 25th edition of Sector we invited some great artists from the young imprint Lanthan.audio based in Koblenz and started in 2015: EDIT SELECT, DEEPBASS, URBANO, DAMIANO DI CAGNO and label owner CHRISTIAN GERLACH. Also we celebrate the release of Urbano’s debut album „23“ this night, supported by the Sector residents Kavaro, Patric Gräfen, Thomas Fierke and Lukas Hoffmann. This party will take place at 2 floors, the Lanthan.audio floor with FUNKTION ONE soundsystem in the ground and the Sector floor in the basement of the Artheater.